The catalog will include 315 selections of unparalleled quality, representing the most revered names the genre has to offer. Online bidding will only be available exclusively through Bidsquare.com. The event will be held at the Grand Sierra Resort in Reno, Nev.
New York, NY, July 26, 2018 -- Every Western art lover's attention will turn toward the same place on July 28th, as The Coeur d'Alene Art Auction holds their 33rd annual Fine Western & American Art auction from the Grand Sierra Resort in Reno. The catalog will include 315 selections of unparalleled quality, representing the most revered names the genre has to offer. Online bidding will only be available exclusively through Bidsquare (www.bidsquare.com). Bidsquare, the exclusive online bidding platform for The Coeur d'Alene Art Auction for the fourth consecutive year, is prepared to get back in the saddle on auction day. After generating over $6 million in bids placed during the live sale in 2017, and totaling over $1 million in online sales, Bidsquare has become a reliable spur in boot heel of the most important event for collectors of Western art. Conveniently, the online buyers premium is the same as the floor bidders premium, an aspect that loosens the reigns and allows online buyers to bid without a moments hesitation. Long known leaders at The Coeur d'Alene Art Auction, such as Howard Terpning, Alfred Jacob Miller, Frederic Remington, Eanger Irving Couse, Edgar Payne and William R. Leigh, amongst many others, will be accounted for during the sale. Museum-quality paintings will cross the block, with one of the headliners being The Thirsty Trapper by Alfred Jacob Miller. Executed in 1850, the painting was in a long-time museum collection and appears at auction for the first time. Estimated at $1,500,000-2,500,000, it is sure to generate substantial institutional and private interest. Estimated to generate a substantial amount of interest on an institutional and private level, this work captures a folkloric nostalgia that deeply resonates with Western art collectors. All eyes will be on what many consider one of William R. Leigh’s finest paintings. Embarrassed (Range Pony in Town) is an iconic oil with the high action Leigh is famous for. Coming from a prominent private collection, the work is estimated at $1,000,000-1,500,000 and may well set a new world record for the artist. In addition, a fine oil by Leigh will be offered, West Virginia Woodchopper with an estimate of $300,000-500,000. 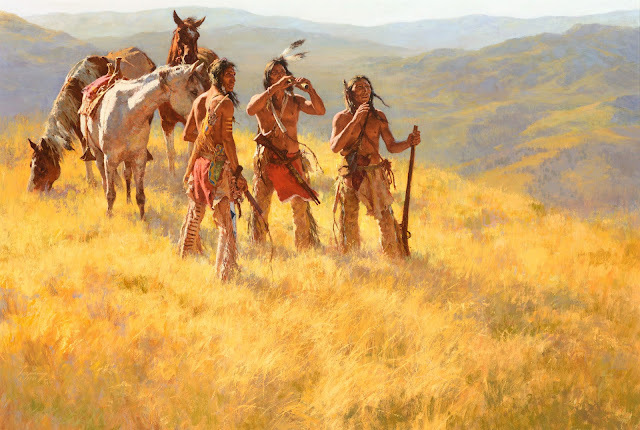 Blue-chip contemporary artists that make up a large portion of the sale will be headlined by Howard Terpning's, Dust of Many Pony Soldiers, a Gold Medal award winner in the 1981 Cowboy Artists of America Show. The oil embodies the technical skill and spirit that collectors of Fine Western & American Art look for. The most important element to be noted is the artist’s ability to capture a "moment to moment" feeling where the viewer and the subjects seem to be experiencing the immediate action together. Panoramic depictions of canyons, golden prairies and majestic mountainsides are met with an assortment of characters that navigate the classic American landscape through a variety of candid narratives. Masterfully painted night scenes, depicting moonlit ancestral teachings, are saturated in the same enchanting reality as the rugged bronzes that capture the fury of a bucking horse or a Trapper's dangerous downward descent. If there's one name in particular that remains synonymous with the Old American West, it's undoubtedly Frederic Remington. Known for his detailed illustrations, writings, paintings and sculptures, Remington essentially kept a record of frontier life during his travels across the Montana territory, the Southwest and the extent of the American West. His ability to recount and draft Western scenes based on his experiences and observations of Native Americans, cavalrymen, scouts and cowboys provided him with a lifetime's worth of fine art commissions, as well as editorial features in a slew of prominent magazines. Above all else, Frederic Remington is seen as the most quintessential chronicler in Western Art. One of his most iconic bronzes, The Mountain Man will be up for auction at Coeur d'Alene Art Auction this year, carrying an estimate of $150,000-250,000. Also being sold to benefit the Seattle Art Museum is an extremely fine collection of 20 paintings by Olaf C. Seltzer. Seltzer hailed from Great Falls, Montana and was influenced by the great Charles M. Russell. Running the gamut of western subjects, this collection was put together by a major patron of the Museum and is sure to generate considerable interest. Since its inception, the auction has also been known to offer the greatest Sporting and Wildlife art. Complementing the Western Art at the Coeur d’Alene Art Auction offerings this year include Carl Rungius’ Coming Up the Valley $80,000-120,000 and At the Deadwater $80,000-120,000. Additional sporting works crossing the block include Marking the Territory $150,000-250,000 by Bob Kuhn, Cape Buffalo $20,000-30,000 by Michael Coleman, and David Shepherd’s Lions with Buffalo Kill $30,000-50,000.